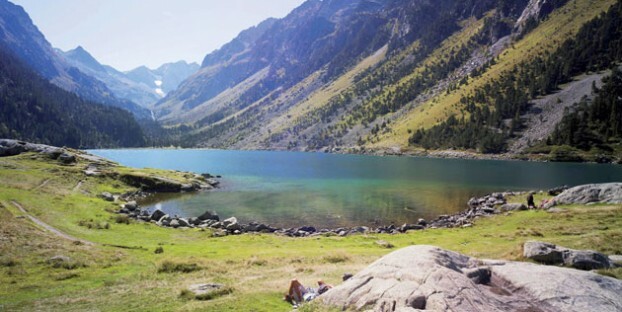 The Pyrenees mountains are a beautiful place for a walking holiday. Stretching along the border between France and Spain they offer incredible natural scenery, great local food and have a fascinating history too. From pilgrimage routes that have been followed for centuries to modern trails, you can pick something to match your ability and the time you have available. You can follow a signed route or hire a mountain guide to lead your expedition – between July and September more intrepid hikers can even go on multi-day treks staying at special mountain huts along the way! A mountain guide is more than someone to plan a route and keep you on course – they are experts in the history and flora and fauna of this beautiful region – a fantastic way to discover the secrets of the Pyrenees. Discover the Cathar history of the region by following ancient paths used by the ‘Bonshommes’ to flee from persecution by the Catholic regime in France. In the 1200s Cathars from all walks of life who were labelled heretics sought refuge in the Ariege mountains and escaped over the border into Spain. The trail stretches 250km between Foix and Port la Nouvelle on the Mediterranean coast. Experience forests, flower-filled meadows, breath-taking gorges and see the majestic ruins of some of the famous Cathar castles along the way. The Grande Route 10 (GR10) is a walking trail of forest tracks and ancient paths, offering an incredible 850km in all, with 470km falling within the Pyrenees region. Walk it all or choose a shorter section, with forests, waterfalls, mountain peaks and wonderful views you’re spoilt for choice! There are mountain villages and thermal spa towns to visit and miles of unspoilt nature just waiting to be explored. Walk in the footsteps of pilgrims on their way to the Cathedral of Santiago de Compostela in Galicia, Spain. This route was one of the most popular pilgrimages in medieval times and it’s still used by thousands of Christians showing their devotion every year. The ‘French route’ runs from Saint-Jean-Pied-de-Port near Osterbat in Pyrenees Atlantiques to Roncevalles in Spain. Pass through pretty towns and villages liberally sprinkled with carved churches and bridges. The beautiful views are a welcome distraction treat for hikers or pilgrims on this sometimes hard-going walking route. Just southwest of Lourdes in the Hautes Pyrenees lies the beautiful Batsurguere Valley, that leads into the Pibeste Nature Reserve. Explore the valley and the foothills of the Pibeste mountains discovering characterful mountain villages, mountain goat herders, tiny farms, old quarries and miles of unspoilt natural scenery. The southern slopes of the mountains have a Mediterranean microclimate with the flora and fauna to match – look out for ‘mouflon’ (wild sheep), and even vultures or eagles circling overhead! Enjoy beautiful mountain scenery as you cross mountain passes into the forests of the Barousse Valley and travel from the Midi Pyrenees into the Hautes Pyrenees department. There are routes following Roman roads into mountain villages through Lourdes and onwards into Spain. There are pre-historic caves, plunging river valleys swelled by snowmelt in the summer months and the impressive Roman Cathedral of Saint Bertrand de Comminges to discover on your way. Book a comfortable holiday let in the Pyrenees as a base for your hiking adventures or, if you are planning a real hiking expedition and plan to be camping or using mountain retreats for a few days, plan a week of rest and relaxation at your own private holiday home afterwards! We have beautiful properties available to rent that are ideal for couples, families or larger groups; why not start planning your Pyrenees walking holiday today?